Enjoy these easy lemon blueberry pancakes with your favorite syrup, blueberry sauce, or a lemon sauce for a delicious, fluffy breakfast. They are easy to make for an everyday breakfast but special enough for a big brunch or festive weekend morning. The bright flavor of the lemon makes this recipe a delight that you'll come back to time and again. The combination of the sour citrus and the sweet blueberries is absolute perfection. The citrus provides a nice counterbalance to the sweetness of the berries. Use a zester tool to easily remove the lemon zest from the fruit. 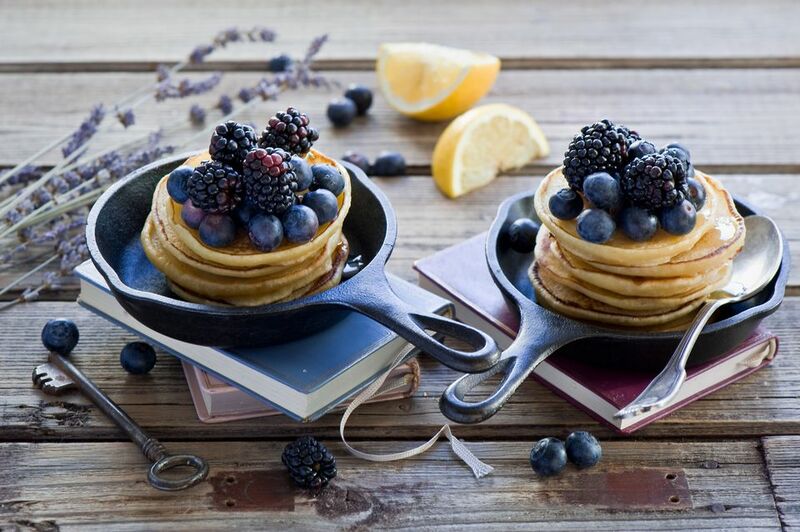 If you are using frozen blueberries, you'll want to let them thaw prior to making the pancakes. As they thaw, they will likely release juices. Prior to using the thawed blueberries, be sure to drain the juice from the berries. If you don't, the pancakes batter will be too liquidy and will likely turn a blue color from all the berry juice. For a brunch or special breakfast, serve these pancakes with hot, crispy bacon, a fruit salad, and some coffee and mimosas. For a fancy touch, dust some powdered sugar on top of the pancakes once they are made. If you don't have blueberries or don't like them, strawberry pancakes are also very tasty. You'll want to cut up the berries into small, evenly sized pieces. You can also use frozen strawberries, but be sure to thaw them completely and follow the tip about draining the berry juice prior to adding to the pancake batter. You could also try limes or oranges instead of lemons. Zest and juice the lime or orange as you would a lemon for a tasty twist on the citrus flavor. Beat the egg until it is frothy. Beat in remaining ingredients (except blueberries). Beat the batter just until it is smooth. Gently stir in the blueberries. Grease a heated griddle. For each pancake, pour about 3 tablespoons of batter. Use a large spoon or a pitcher to place the batter onto the hot griddle. Cook pancakes until puffed and dry around edges. Turn and cook the other side until golden brown. If you are making a large batch and need to keep the pancakes warm, simply heat your oven on low or set to 200 F. Place the cooked pancakes onto a cookie sheet and keep in the oven. Serve them as soon as possible or once your whole pancake batch is done. Store any leftover pancakes in a sealed container in the refrigerator for a few days. They can be warmed quickly in the microwave (although they will lose their crispiness) or heated up again on a hot skillet, which will help keep that crispiness.